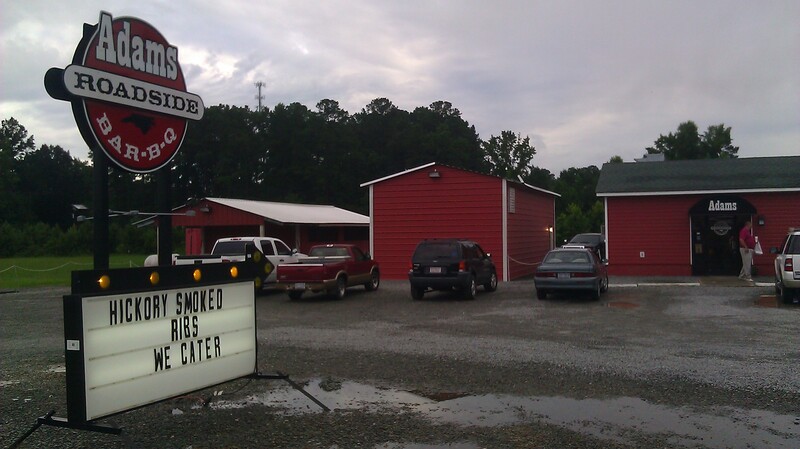 I had high hopes for Adam’s Roadside Bar-B-Q, in part because of the phrase “hickory smoked” on the sign outside and in part because there is another barbecue joint on Highway 70 in Goldsboro by the name of Wilber’s. I figured Adam’s must be doing something right to compete in Wilber’s country. Unfortunately, my sense is that what Adam’s is doing to compete is not to serve superior barbecue. While Wilber’s focuses on the fundamentalist wood-fired, whole hog barbecue native to Eastern NC, Adam’s has gone whole hog into the new age of barbecue. Need some “Texas-style” brisket? Adam’s has it. Pork ribs? Sure. Chicken? Why not? Turkey? Yes! NC-style chopped pork BBQ? Oh yeah, that too. As frequent visitors of this site know, when I review a barbecue joint I focus primarily on the Holy Trinity of North Carolina barbecue, namely chopped pork, slaw, and hush puppies/corn bread/corn sticks. The rest of the menu, with some exceptions, is just noise. 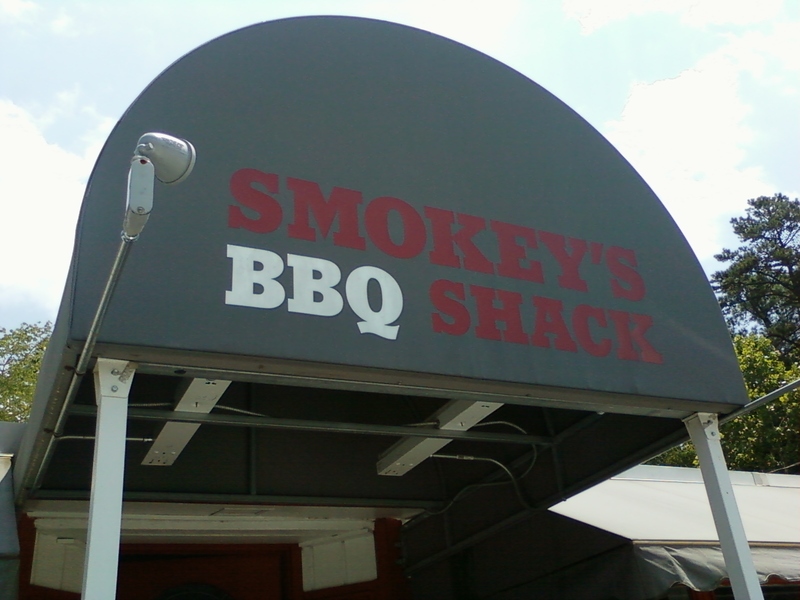 Sometimes it’s delicious noise, sometimes it’s not, but it is not how I judge a North Carolina BBQ joint. 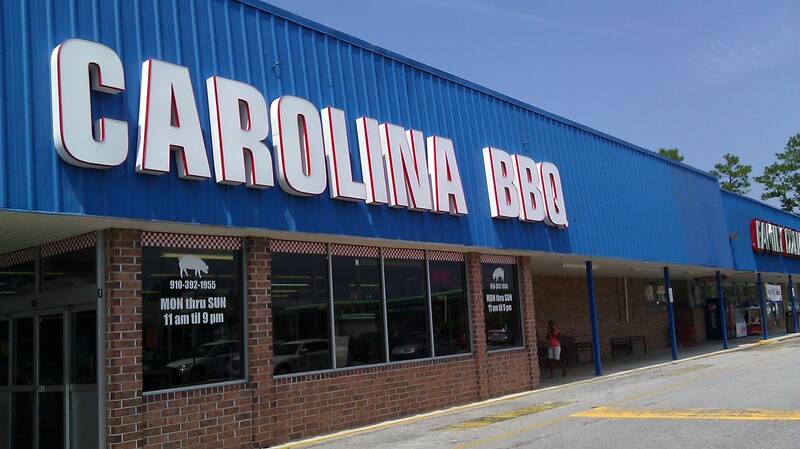 Hours: Monday to Sunday, 11 a.m. to 9 p.m.
Carolina BBQ has a couple of locations in Wilmington, one in Kenansville, and one somewhere in Virginia, if my waitress was telling me the truth. I stopped at the N. College Street location, which is a mile or so from Interstate 40 at exit 420. Speaking of 420, one would need to be mighty stoned to think the barbecue is good here, but I still enjoyed parts of my meal despite being stone cold sober. 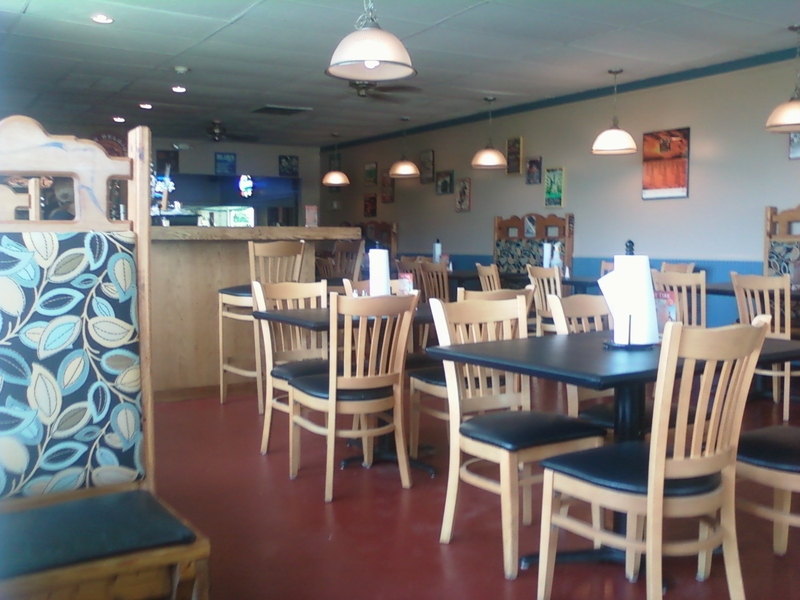 The best part about a visit to Carolina BBQ at N. College Road is the atmosphere. 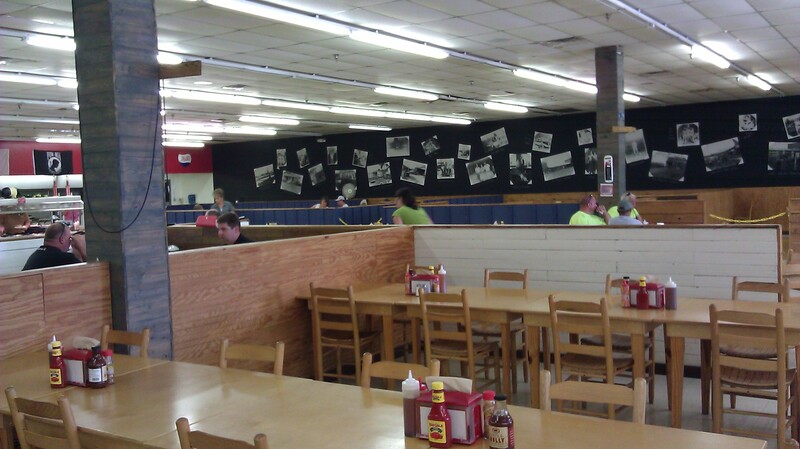 It must be the largest barbecue restaurant in the state in gross square footage (the picture at left does not do the vastness of the space justice). It feels like you could fit an entire grocery store inside the restaurant, which is quite true given it inhabits a former Food Lion. 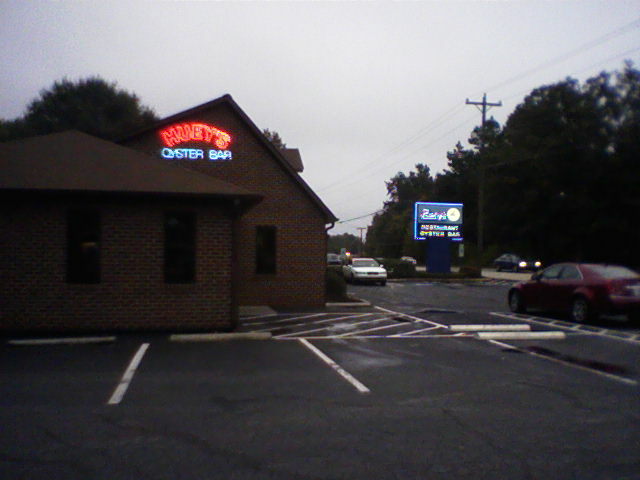 As the hermit crab-like replacement for Food Lion, Carolina BBQ is the de facto anchor tenant in a strip mall that features a nail salon, Subway, and a few other non-descript businesses (I would describe them were they not so resolutely non-descript). I was sincerely impressed with the interior decorating job, which managed to make a grocery store feel almost homey. Sure, the seating capacity is enough to house probably 10 times the number of people ever likely to enter Carolina BBQ at one time, but it is a creative and attractive reuse of a difficult to fill space. The large historical BBQ photos printed on the far right wall are particularly interesting. I’ve always been wary of seafood restaurants that are located far from the coast, and even more wary of beachside barbecue joints. Huey’s Restaurant & Oyster Bar is located in Mebane, a long ways from the beach but on the edge of Lexington-style barbecue country. The family-owned business has been around for well over 50 years and has a menu sure to please anyone. (Don’t take my word for it, listen to the woman who magically teleports herself onto the restaurant’s website.) Well, almost anyone. 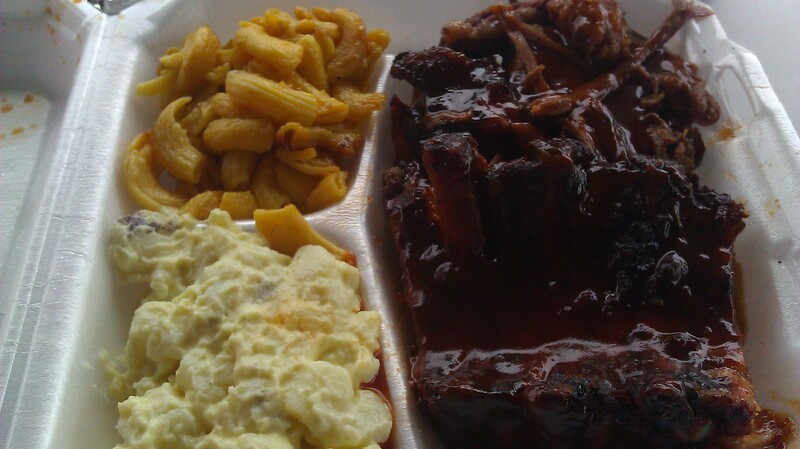 Huey’s features a large array of dishes, with an emphasis on steak and seafood, as well as barbecue. You can get everything from $26 filet mignon with lobster to $17 snow crab legs to a $6 BBQ tray. Huey’s also offers flounder, shrimp, clams, oysters, scallops, chicken, jalapeno poppers and much more. Guess what I had? Yeah, well that comes as no surprise. What is surprising is that the barbecue at this 54 year old dining institution tastes institutional. 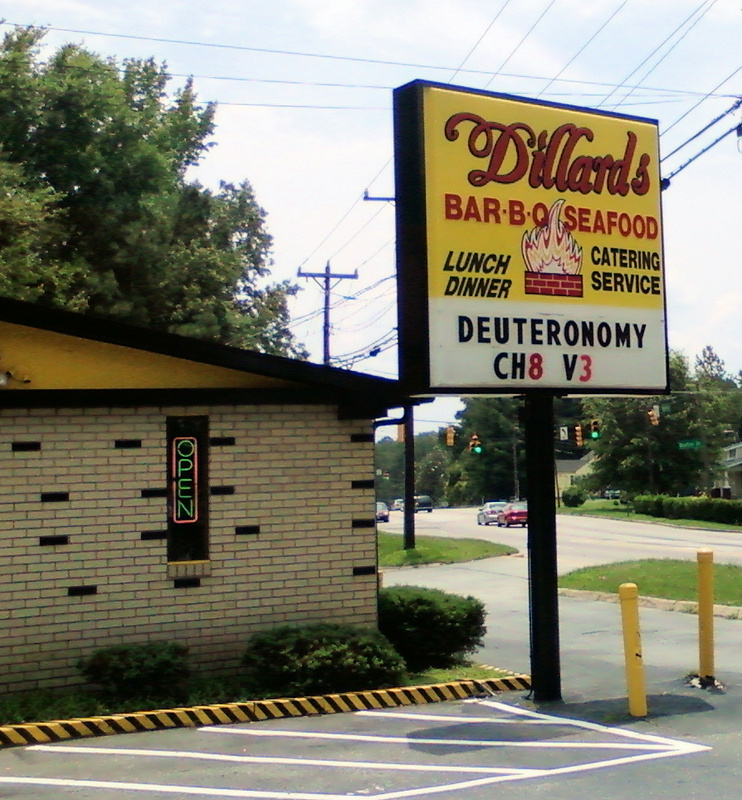 While most barbecue joints use their marquee signs to boast or advertise weekly specials, the sign outside of Dillard’s has read “Deuteronomy 8:3” for as long as I can remember. Indeed, man cannot live on bread alone. Sometimes he craves pork. Dillard’s has been providing Durham residents and visitors with much more than bread since 1952, when its late founder Sam Dillard first started selling barbecue. Mr. Dillard was a devout Christian, so the Deuteronomy 8:3 reference is not some tongue-in-cheek statement that a younger pitmaster might put on a sign to lure in the hipsters. At Dillard’s the sign is sincere and heartfelt. Unfortunately, while the fellowship at Dillard’s remains intact the quality of their cooking has suffered over the years.